Why Choose a Waterproof Work Boot? What Determines the Type of Waterproof Boot you Choose? Whether you’re powering through mud, wading through streams, or standing in deep water, you need to be assured that your feet will stay warm and dry. To be ready for anything, you want the best waterproof work boots available. With so many boots on the market claiming to be waterproof, how do you know they deliver on the claims? You can’t buy them all and test them in water before you decide. 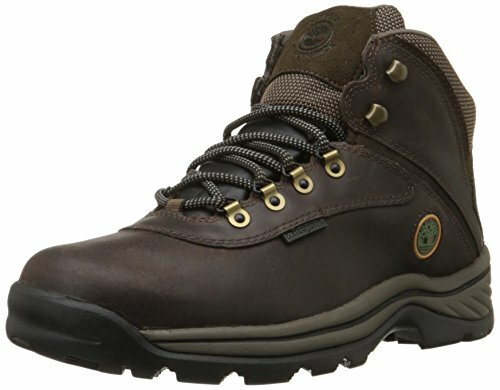 To help, we compiled reviews of the the top waterproof work boots. Each of these recommendations have the quality, durability, and craftsmanship that you can trust to keep you dry no matter how much water stands in your way. 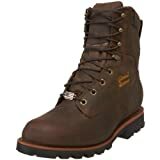 The White Ledge Men’s Waterproof Boot is constructed with a premium full grain waterproof leather upper that is seam sealed to keep your feet dry. For comfort, they feature a padded tongue and collar, along with a removable dual-density Eva footbed that’s perforated for additional airflow. The solid rubber outsole is equipped with multi-directional lugs for good grip on various surfaces. In addition, these boots have an external heel covering to protect the rear of the foot. These particular boots run true to size, but are not recommended for wide feet. Finally, they are highly durable and are known to last for years. 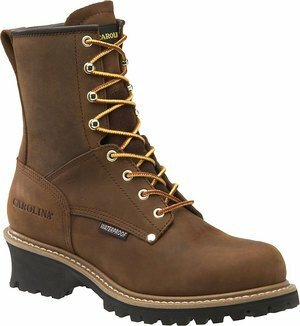 This 8” shaft Carolina Logger Boot contains a steel shank for support and is electrical hazard rated. The 100% waterproof membrane keeps water where it belongs, outside of the boot and not near your feet. This is a soft toe leather work boot with an easy lace-up feature so you can tighten or loosen the support as needed. The one-piece rubber lug outsole provides superior traction and grips to surfaces without the worry of slipping. For comfort and support, they are equipped with an EVA insole and the Cambrelle lining wicks away moisture and keeps your feet dry even while trekking through standing water. These boots are not insulated but are known to keep your feet reasonably warm in colder temperatures. Carhartt offers this slip-on, leather and nylon constructed boot that’s engineered for those who require waterproof protection. To further enhance the protection, Litefire waterproof insulation is incorporated in these boots to not only keep your feet dry but to also keep them warm. 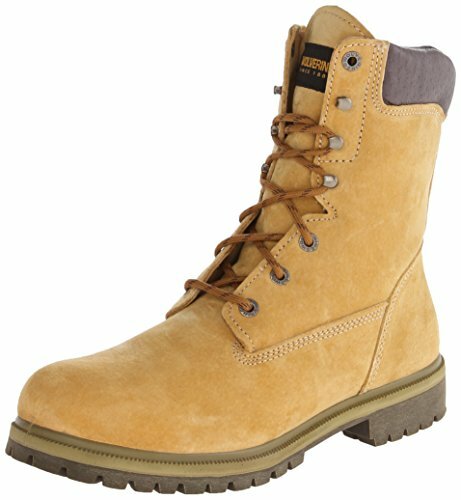 The Mud Well ST Work Boot includes a safety toe to protect you from the hazards of many jobs. Plus, the aggressive tread on the outsoles is sure to grip even the most precarious surfaces. 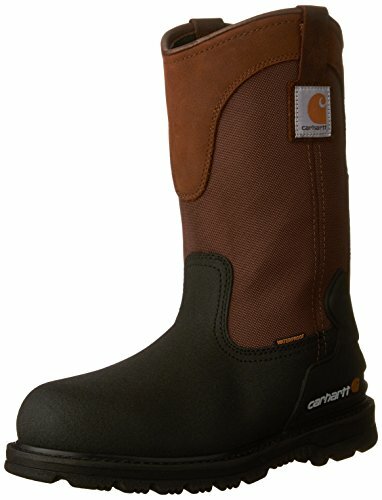 Since they are taller, these boots are ideal for anyone who is has to stand in water while they work. The Wolverine Men’s Waterproof Boot is lightweight and constructed with a full-grain leather upper and matching 8” leather lace-up shaft. In addition, they are equipped with a mesh lining that manages moisture. This is a soft toe boot and not recommended for those who require the protection of a safety toe, but they are perfectly equipped to handle any wet elements that are thrown at them. The synthetic soles of these boots are permanent direct attached, which makes them one of the most comfortable outsoles available. They also provide ample traction for slip-resistant footing and nylon shanks are incorporated in these boots offer flexible support. These boots run large, so keep that in mind when ordering. This Chippewa is a solid waterproof boot that is also insulated to keep you comfortable in cold weather. Constructed with waterproof leather and Rubi Dry-Lex lining that manages moisture. A rounded toe provides enough extra room and they are engineered with a Goodyear welt outsole with thick traction that grips to surfaces aggressively. The hardware featured on these boots is non-tarnishable, so you can be sure they will always clean up nicely. Chippewa boots are known to last for years with the only thing needed is replacement laces. Standing in water is not an issue with these boots since they are durable and sealed tightly. An easy pull-on tab is located in the rear of the boot for your convenience. You never know when you’ll end up getting your work boots wet. It could be an accident or a freak rainstorm but you’ll wish that you chose a work boot that offered additional waterproof protection. However, if you work in areas where water is or can be an issue, it’s best to be prepared and to have the right boots. Work boots are generally constructed out of leather and sometimes contain some synthetic material. If you ever get non-waterproofed leather boots wet, you may know that they can quickly be ruined. Not only does water turn the leather into a stiff, cracked, shrunken or stretched version of it’s former self, but they will also begin to fall apart and eventually become useless. Picking waterproof boots will save you money in the long run, since they will last you longer than average boots. There is nothing more uncomfortable than trying to work in soggy conditions and your feet will take the brunt of the discomfort, which could mean rubbing, blisters, and shriveled feet. Furthermore, the smell of wet boots is atrocious and will eventually produce mold. That’s not something to look forward to. So before you decide to invest in a pair of work boots, think about the possibilities while wearing them. If you already have boots that are not waterproofed, you can always learn how to add some waterproof to your boots. First off, it’s important to realize that waterproof and water resistant are two different things. Waterproof means that you can stand in water, walk across creeks, and sink your work boots into ample water without it penetrating to your feet. Water resistant is just a deterrent for water, which means it will detour water in light conditions, such as normal rain, or walking through puddles, but standing in water wouldn’t be recommended. Furthermore, water resistant applications can be placed on any boot, whereas, waterproof has to be constructed into the material. A boot can be made to be water resistant, but can’t be made to be waterproof. In order to determine what type of work boot you need, you’ll have to evaluate how much water you’ll be working in. The height of the boot is very important. A taller shaft means more protection and a big difference between inches and feet of water. For instance, a short shaft boot would suffice for someone who only comes in contact with puddles and maybe a few inches of water or rain. A taller shaft boot will allow you to submerge your work boot into greater depths without water seeping in from the top. Your waterproof boot is only dependable if water doesn’t reach the top of the boot no matter how much waterproof lining is incorporated. There are materials that are better than others when it comes to waterproofing. Rubber comes to mind when we think about work boots that are waterproof. That’s a fair assumption since rubber boots have long been the ultimate in waterproof protection. To this day, rubber work boots are manufactured for various reasons. Generally, they are usually generic, with the exception of a few brand names that incorporate features such as steel toes, reinforced soles, and slip resistance. These popular for hunting and fishing. Rubber boots will always be rubber boots, and very dependable to say the least. With that being said, rubber boots aren’t as good for hazardous job sites as traditional leather or other synthetic materials since they don’t offer the additional protection that is required. Read our reviews of the best hunting boots available. Did you ever imagine socks can be waterproofed or water resistant? Well, they can be, and though waterproof work boots offer ample protection, there might be those instances that you get a lot more water than you bargained for. For this reason, waterproof socks will work in conjunction with your already waterproof work boots. Here are a few options to check out that might interest you, since they are popular options. 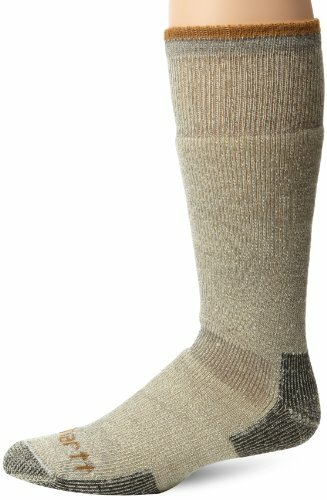 These Carhartt Arctic socks are specifically designed for cold weather wear and are well padded. They wick away the moisture caused by water seepage in the interior of the boot. Though waterproof boots are meant to remain that way, you never can be sure that water won’t get in from overstepping your boundaries of the depth they can handle. These socks also contain an odor eliminating technology and are constructed out of various materials such as wool, Lycra, nylon, polyester, and acrylic. They are also machine washable, which is convenient. 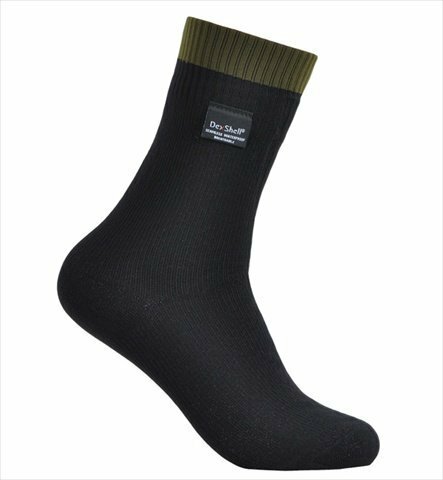 For a highly dependable waterproof sock, the Dexshell Waterproof Breathable Thermo-Lite Sock offer insulation for colder temperatures, plus are completely waterproof. They are an ankle length sock and would be suitable for boots that are the same height. Plus, the breathable fabric resists odors associated with long wear. The outer shell contains an abrasion-resistant nylon and elastic for a close fit and the interior is lined with a Porelle high-performance waterproof, breathable fabric. No matter the temperature, your feet will remain warm and dry. Plus the material feels soft against your skin. 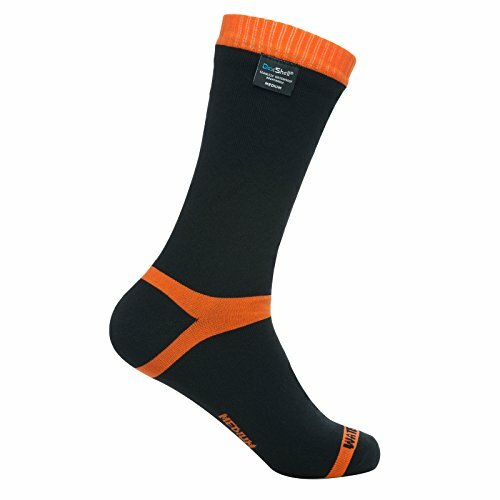 Another great choice for a waterproof sock is the Dexshell Hytherm Pro Waterproof Socks. They are designed to keep your feet exceptionally dry from leakage, and also are insulated for warmth. Stand in high water and your feet are going to stay dry. The outer shell is 96% abrasion-resistant nylon, 3% elastane, and 1% cuff elastic. The interior is constructed of merino wool, acrylic, and nylon. In addition, these socks are breathable to allow adequate airflow and resist odor. These socks are sized to men, so order accordingly. 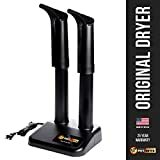 They also run a lot thicker than regular socks so make sure you have adequate room to accommodate them without creating a tight squeeze in your boots. Hopefully, you’ve learned how important having the best waterproof work boots can be. They are a necessity for work in unexpected as well as expected wet conditions. Our waterproof boot reviews are designed to assist you in making this very important decision. We want you to be satisfied with your purchase, and not waste your hard earned money on generic brands. It’s important for us to deliver information that is helpful. Don’t be fooled by fake reviews that are made to build up the reputation of an unproven brand. That’s not fair and could be completely false. We are consumers just like you, and we feel that people deserve honest opinions and reviews about the best selling work boots available on the market.